The Romanticismo apartment has been recently refurbished (11.2016) to the highest standards, It is situated on the top of Mount Igueldo where the views are amazing!! You can literally see all of San Sebstian from this fabulous apartment. 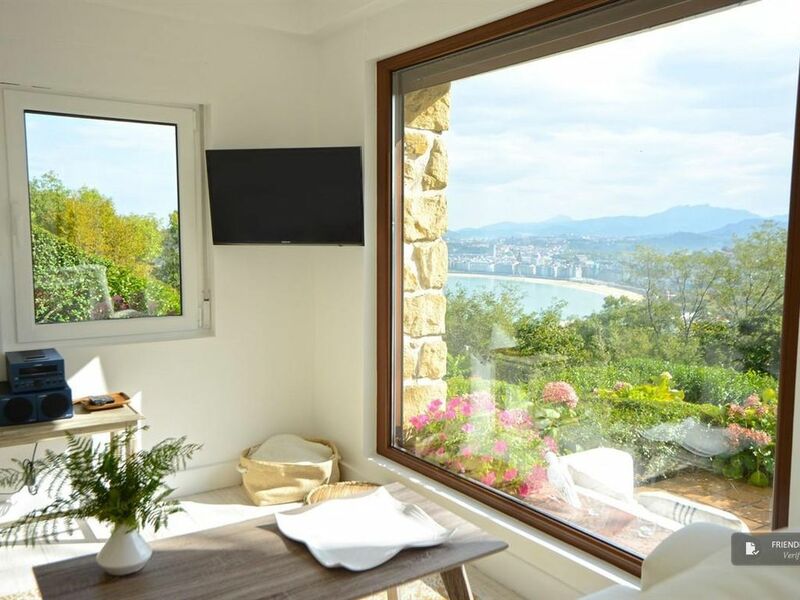 The guest is approximately 2.5 km from the ondarreta beach and 3.5 Km from the centre of San Sebastian and a car is recommended for accessing this great apartment otherwise there is a bus every 30 minutes, the bus station is 400 meter away from the apartment. The apartment is a charming and spacious of approximately 85m2. The interior of the apartment is welcoming and cosy, with a wonderful terrace/garden area where the guest can enjoy some pretty impressive views of the bahia of la concha.. This is a two bedroomed apartment; you can practically hear the birds sing as you wake up each morning. Both bedrooms are exterior. The actual apartment is spacious and looks out onto the garden. The living room contains a dining table and a sofa,. You will find the kitchen, seperate but not private from the living/dining area, which comes with all the basic mod cons to make your visit a hassle free one. The bathrooms come fully equipped with shower, toilet, hairdryer, towels, etc. The kitchen is american in style and newly fitted, and comes with all the modern conveniences such as washing machine, dishwasher, oven, microwave, vitorcermic cooker, fridge, etc; it also comes with beater, coffe maker, toaster, pots and pans, plates, cutlery and so on and ensures the guest will feel completely at home. As always, fresh towels and sheets are provided for all guests. Romantacismo apartment a lovely, tranquil spot and a good choice for your visit to San Sebastian. Absolutely WONDERFUL!!!! The Apartment looks EXACTLY like the photos!!!! This property stole our heart the moment we stepped out of the car. Our stay there was for 5 nights and what a magical time we had! We were 2 couples that were traveling through Northern Spain and Southern France for 1 month. This property Trumped them all. Lucia is such a doll!! We did not want to leave. You will not be disappointed, signed picky traveler. Das Apartment ist sehr komfortabel, die moderne Innenarchitektur und Einrichtung sind geschmackvoll und liebevoll gestaltet. Die Lage mit der Aussicht auf die La Concha Bucht von Donostia, bei Tag und Nacht, ist fantastisch, der Garten schön angelegt. Man kann die Ruhe genießen und sich im Haus und Garten ungestört aufhalten. Der Empfang und die Verabschiedung waren sehr persönlich und herzlich. Im Apartment ist alles vorhanden, was man braucht, alles ist sehr gepflegt. Die Fahrt in die Stadt mit dem Auto über den Paseo Igeldo ist allein schon ein Erlebnis und problemlos. Wir werden gern wieder kommen, wenn es unsere Zeit erlaubt. Very clean, very nice. Even better than the pictures. We loved this place. Lucia was a great hostess and welcomed us with a bottle of the delicious Cava that her husband makes. They also had two other varieties of wine, one red and one white that were also delicious. The view from the patio was amazing and we almost didn't want to leave. We had a great time exploring St. Sebastian and the Basque coast, and also drove up to Biarritz for the day, which was also very nice. I should mention that when we had a problem with one of the shower drains, Lucia called the plumber immediately and took care of it for us. The drive to the apartment was also beautiful, winding through a tree-lined road through the woods. Can't wait to return. We would recommend this place to anybody.